Notas aquáticas são as últimas na minha preferência. Gosto de patchuli. Equilibrando notas doces e quentes. Aquatic notes are the last ones in my preference. Taste of patchuli. Balancing notes hot and candies The combination of patchuli and aquatic notes must be interesting. Perhaps it is not pleasant. Lótus and water lily theoretically seems a good combination. I was curious for the perfume… XOXO. Betty. 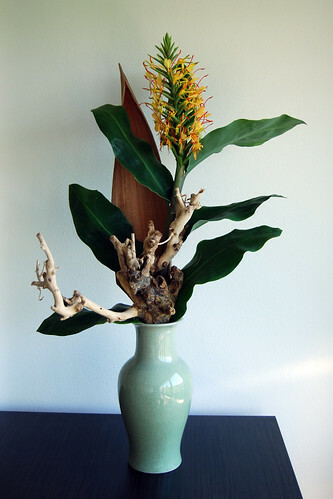 I don't know about the smell, but the ikebana arrangement is beautiful. Japanese people really have a way with decorating, don't you think? In two words, simple and elegant. You might not like that one, because it is rather watery/aquatic. The Dark Amber & Ginger Lily might be more to your taste. Yes, Japanese design is so beautiful! I love the sense of simplicity and elegance and at the same time there is always flow to the designs, and always references to nature, which make them more emotional despite the high level of precision.